Let me start off by saying that I am a huge Transformers fan, always have been. 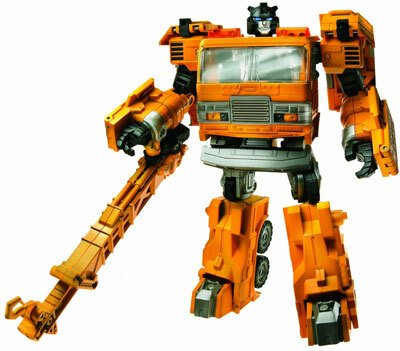 The current line of Transformers “Generations” action figures are great models that resemble the robots they portray, and they transform easily. But the movie-themed action figures? Intricate and horribly complex to transform. A couple of years ago when the first movie came out, I purchased a Bumblee Bee action figure. After a little struggling, it was transformed and standing flimsily on the shelf. Sometime after that, maybe around the time of the second movie, I purchased a Decepticon bulldozer. To say that the transformation process is difficult is a bit light – it is frustratingly complex. Not having learned my lesson, I have since purchased Arcee and another Autobot motorcycle, and more recently, a Voyager class Optimus Prime and Ironhide. My goodness, these are all the worst Transformer action figures I have ever seen. Transformers are supposed to, you know, transform. Pieces wouldn’t move where they were supposed to go, parts popped off, and the entire ordeal was maddening. And when all is said and done, the figures are difficult to stand up and pose. Whose fault is this? Hasbro or Michael Bay? No doubt the models are so complex to transform because they’re detailed to resemble on-screen characters. But if a late-20s adult has problems transforming a Transformers action figure, how is a child going to manage? While the Transformers Generation action figures are blockier and less detailed than the movie action figures, they offer almost as much articulation and loads more playability. Not that I play with or regularly transform my action figures outside of the initial conversion (20th anniversary Optimus Prime excluded). So if you’re looking to buy a Transformers action figure for a child this holiday season, I strongly recommend that you look at the Generations series and urge you not to seriously consider any of the movie-series action figures. Unless of course you don’t mind helping every time your kids want to transform their figures, at which point I’ll whip out an I told you so. I’ll second that! My half-brother got some transformers toys for christmas from the grandparents (they never gave ME fun toys like that! >:( |) and, as I was working with them, several pieces broke off right in my hand. Not only did I feel terrible I broke HIS toys, I felt horrible because my grandmother was sitting right there and was disappointed and disheartened that the toys she got were, in all honesty, junk. We then pulled out the OLD transformers toys (from when it was a TV series, remember!? Because I…don’t) and they were extremely well made and solid. There was a click, CLICK, CLUNK! and all around solid feel with those. Just like our tools, our toys are being made more cheaply with every passing year. At least we still have Lego though. Still quality toys at…well, you pay a premium for the quality of Lego but it’s worth it. I don’t think it’s that they’re shoddily made, but that they’re designed too intricately. I have a few of the “Transformer Generations” figures, and they are just superior in both design and construction. I picked up a few of the first movie figures as well, thinking they would look good on a shelf, but they’re just flimsy and floppy. Forget about transforming them back – they feel like they’ll break in half, and probably will without the utmost gentle of handling. The figures from the ’80s and ’90s may look a bit cruder, but they’re infinitely more durable. As for LEGO, one can tell that they’re investing serious resources in their design team. I picked up one of the Star Wars sets for fun and then bought a few more. And the modular buildings, such as the Fire Brigade, – are absolute joys to build as well.